This appendix contains screenshots and descriptions for all of the Repository Creation Utility screens. Section A.3, "Database Connection Details"
Section A.4, "Select Components (for Create Operation)"
Section A.5, "Select Components (for Drop Operation)"
Section A.9, "Summary (for Create Operation)"
Section A.10, "Summary (for Drop Operation)"
Section A.11, "Completion Summary (for Create Operation)"
Section A.12, "Completion Summary (for Drop Operation)"
This is the first screen that appears when RCU is started. Note the navigation pane on the left that summarizes the tasks that RCU will help you complete. Each item in the navigation pane represents a specific screen that will prompt you for information required to create or drop your schemas. Click Skip This Page Next Time if you do not want to see the Welcome screen the next time you start RCU. Use this screen to select the action you want to perform. Select this option to perform both System Load and Product Load operations. Users must have DBA or SYSDBA permissions to select this option. This option can be performed on any certified database. Create the schema_version_registry (if not already present). Create entries in schema_version_registry for each selected component, set the proper access permissions, and set the status of the component to "LOADED" in the schema_version_registry table. This option is only supported on Oracle and Oracle EBR databases. Select this option to load and create procedures, functions, tables, indexes and other objects within schemas and run any action that does not require DBA access. Any non-DBA user or the REGISTRYOWNER user can select this option. Select Drop Repository to remove component schemas from the database. If an error occurs while the connection is being established, the error message(s) appear in the Messages field on the Database Connection Details screen. Specific database requirements for the various schemas can be found in the Oracle Fusion Middleware System Requirements and Specifications document. For certified database versions, see the System Requirements and Supported Platforms for Oracle Fusion Middleware 11gR1 document, which is available on the Oracle Fusion Middleware Supported System Configurations page. For Oracle RAC databases, specify the VIP name or one of the node names in this field. Enter the port number for your database. The default port number for Oracle databases is 1521. Specify the service name for the database. Typically, the service name is the same as the global database name. If you are unsure what the service name for your database is, you can obtain it from the SERVICE_NAMES parameter in the database's initialization parameter file. If the initialization parameter file does not contain the SERVICE_NAMES parameter, then the service name is the same as the global database name, which is specified in the DB_NAME and DB_DOMAIN parameters. Enter the user name for your database. The default user name is SYS. Enter the host name, IP address, or complete server name in host\server format of the server where your database is running. Enter the port number for your database. Specify the name of your database. Specify the name of a user with administrator privileges. Select Yes or No from the drop-down list. Specify the name of a user with DB Owner privileges. The default user name for IBM DB2 databases is db2admin. Below is the Select Components screen if you selected Create on the Create Repository screen. The following table describes the fields on this screen. Use this option to create schemas using an existing prefix which you can select from the drop-down list. If you select this option, you can only create schemas that do not already have this prefix in the database (for example, if DEV_MDS already exists, you will not be able to select the MDS schema on the page to create it again). Use this option to create a new custom prefix that can be used to group your schema together. The prefix name must be a minimum of one character in length and cannot exceed 12 alphanumeric characters (0-9, a-z, or A-Z) in length (not including the underscore character). Prefixes should not start with a number. No whitespace or special characters are allowed. You can edit the schema name or prefix by clicking the item you want to change in the "Schema Owner" column and editing the table cell directly. For more information about custom prefixes, see Section 1.2.3. Use the "Component" column in the table to select the component schema you want to create. When you select a component, any other components that may be required by the component you select are also selected. 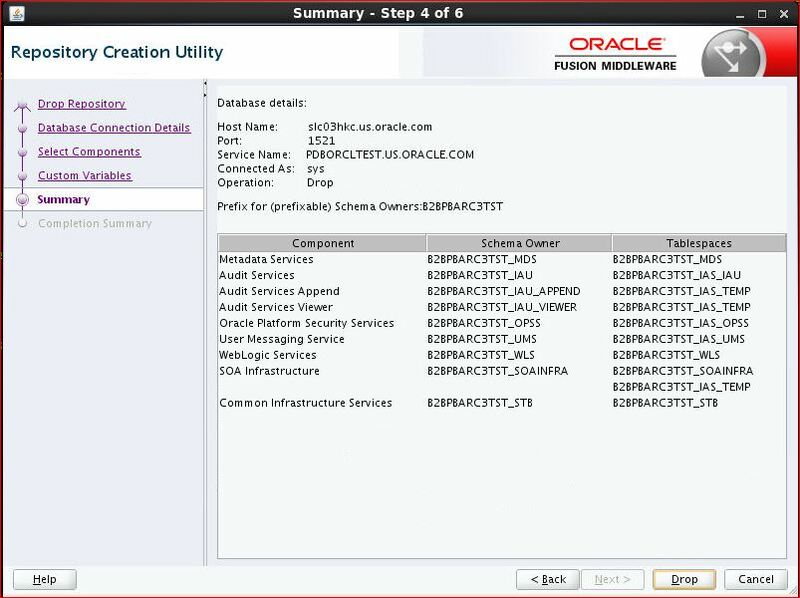 For example, if you select Oracle Platform and Security Services, then the Audit Services schema is also automatically selected if it has not already been selected. 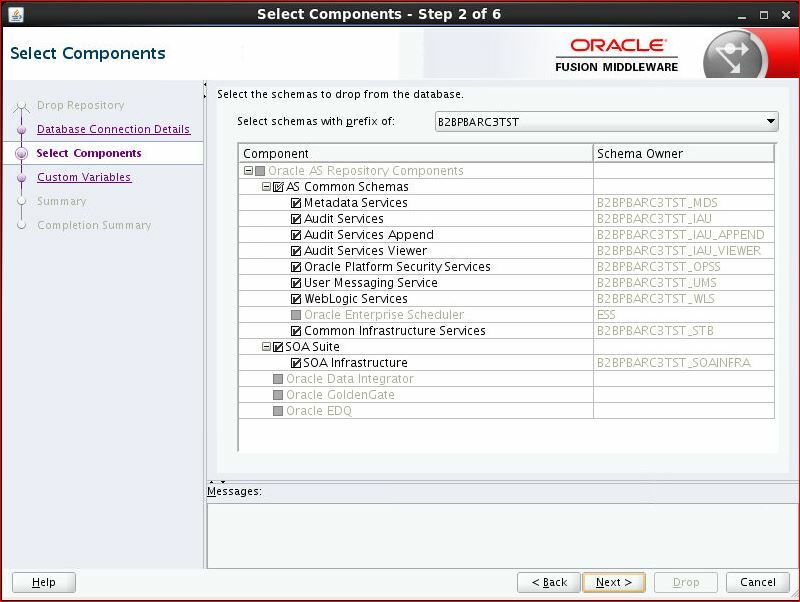 The Audit Services schema is required by the Oracle Platform and Security Services schema. If a component has a plus sign (+) next to its name, then there are sub components available. Click on the plus sign (+) to expand the category to view all sub components. If you want to select a component with all its subcomponents, click on the top-most box with the plus sign (+). If you are creating component schemas on an IBM DB2 database, see important information in Section 1.1.4. This column shows the name of the schema owner for each component (custom prefix and schema name). You can edit the schema owner value by clicking the item you want to change in this column and editing the table cell directly. You must remember the Schema Owner name for the components you are installing; you will need this information during the configuration phase of your Oracle Fusion Middleware product installation. Oracle recommends that you write this value down. Click Next when you are finished specifying your prefix, schema names, and selecting components. The following screen appears, indicating the progress of component prerequisite checking before the schemas are created. If an error occurs during the prerequisite checking, the error message(s) appear in the Messages field on the Select Components screen. Click OK to dismiss this screen. Below is the Select Components screen if you selected Drop on the Create Repository screen. Use the drop-down list in this field to select an existing custom prefix - all schemas associated with this prefix will be removed. Select the component schemas you want to remove. NOTE: Unlike create operations, schema dependencies are not handled automatically by RCU for drop operations. When you remove a schema, you must also remove the schemas which depend on the schema you are removing. For example, the Audit Services schema is required by the Oracle Platform Security Services schema; if you remove the Audit Services schema, the Oracle Platform Security Services schema will no longer work. This column shows the schema owner (custom prefix and schema name). For drop operations, this column cannot be edited. Below is the Schema Passwords screen. Select this option if you want to use a single password for all schemas and their auxiliary schemas. In the Password field, enter your password. Enter your password again in the Confirm Password field. Select this option if you want to specify different passwords for the main schemas, but still have the same password used for their respective auxiliary schemas. If you select this option, only the main schemas will be visible in the table. For each schema, you must enter each schema's password in the Schema Password column in the table, and enter the same password in the Confirm Password column. Select this option if you want to specify unique passwords for the main schemas and auxiliary schemas. If you select this option, all main schemas and auxiliary schemas will be visible in the table. For each schema and auxiliary schema, you must enter the password in the Schema Password column in the table, and enter the same password in the Confirm Password column. You must remember the passwords you enter on this screen; you will need this information during the configuration phase of your Oracle Fusion Middleware product installation. Oracle recommends that you write these values down. Custom variables are required by some products for additional product configuration information. 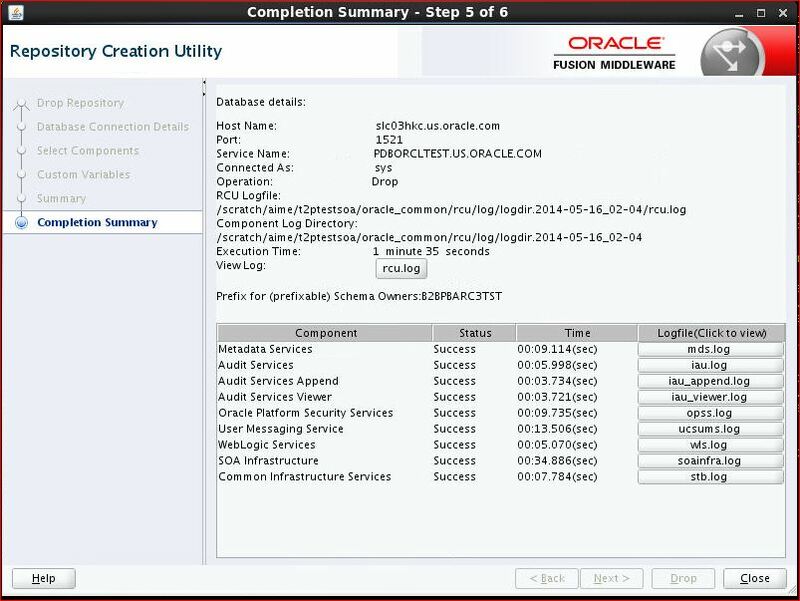 This screen only appears if Oracle Data Integrator or Oracle SOA Suite are detected in the Oracle home in which RCU was started. If Oracle Data Integrator is detected, the Custom Variables for Oracle Data Integrator will be visible. If Oracle SOA Suite is detected, the Custom Variables for Oracle SOA Suite will be visible. If both Oracle Data Integrator and Oracle SOA Suite are detected in the Oracle home, both sets of custom variables will appear on this screen. Password of the supervisor user. You must confirm this password on the following line. Use Development (D) for creating a development repository. This type of repository allows management of design-time objects such as data models and projects (including interfaces, procedures, etc.) A development repository also includes the run-time objects (scenarios and sessions). This type of repository is suitable for development environments. Use Execution (E) for creating an execution repository: This type of repository only includes run-time objects (scenarios, schedules and sessions). It allows launching and monitoring of data integration jobs in Operator Navigator. Such a repository cannot contain any design-time artifacts. Designer Navigator cannot be used with it. An execution repository is suitable for production environments. A unique name for the Work Repository (for example: DEVWORKREP1). Provide a password for the Work Repository. If you provide a password, you must confirm the password on the following line. Select the encryption algorithmm, either AES-128 or AES-256. Specify the database profile you want to use for Oracle SOA Suite. This determines the size of the SOA database. The default value is SMALL. Specify whether or not you want to enable Healthcare Integration for Oracle SOA Suite. Section A.8.1, "Default Tablespace Mappings"
Section A.8.2, "Changing Default and Temporary Tablespaces"
Section A.8.3, "Viewing and Changing Additional Tablespaces"
Section A.8.4, "Managing Tablespaces and Datafiles"
Click Next when you are finished with your tablespace information. The following screen appears, asking you to confirm the creation of tablespaces for any new schemas. RCU only creates tablespaces for those components associated with RCU. Click OK to continue. The following screen appears, indicating the progress of the tablespace creation. Click Stop to cancel tablespace creation. When the tablespaces are created, click OK to dismiss this window. The default tablespace mapping for each component are shown in Appendix B. In the "Default Tablespace" and "Temp Tablespace" columns, you can click on the tablespace cell to select from a list of available additional tablespace names. To change the default tablespace for a component, select the tablespace name in the Default Tablespace column, then select the tablespace name you want to use from the drop-down list. You can have your components use as many or as few tablespaces as desired to suit your configuration. To change the temporary tablespace for a component, select the tablespace name in the Temp Tablespace column, then select the tablespace name you want to use from the drop-down list. Some components have additional tablespaces associated with their schemas. If this is the case, the Additional Tablespaces button will appear on this screen. If none of the selected components have additional tablespaces, then this button will not appear. To view additional tablespaces associated with the selected components, click the Additional Tablespaces button. Only those components with additional tablespaces as defined in the configuration files will appear on this screen. To change the tablespace you want to use for a component, click in the "Tablespace Name" column and select the tablespace you want to use from the drop-down list. Section A.8.4.1, "Adding, Modifying, and Removing Tablespaces"
Section A.8.4.2, "Adding, Modifying, and Removing Datafiles"
Only tablespaces that will be created by RCU can be modified or removed. Tablespaces that existed before RCU was launched are visible on this screen but are grayed out and cannot be modified or removed. Only tablespaces that are used by a component are created. You can specify a new tablespace here, but unless it is actually used by a component it will not be created. Edit the tablespace name this field to change the name of your tablespace. Specify whether you want this tablespace to be a temporary tablespace or permanent tablespace. Specify the block size (in Kilobytes) to be used for data retrieval. Select Use Bigfile Tablespace if you want to create a bigfile tablespace; this is typically used if you have single large files instead of multiple small files. Select Use Automatic Segment Space Management if you want to use bitmaps to manage the free space within segments. To add a tablespace, click Add and specify the same details as above (for modifying a tablespace) for your new tablespace. To remove a tablespace, select the tablespace name from the navigation tree, then click Remove. This tablespace will not get created. In the Datafiles section, specify the datafiles that make up the selected tablespace. Specify the name of the datafile. NOTE: Datafile names with a dash or hyphen (-) character are not permitted. Specify the location where this datafile will reside. Specify the initial size of the datafile. Use the drop-down list to specify the size in kilobytes (KB), megabytes (MB), or gigabytes (GB). Select Automatically extend datafile when full (AUTOEXTEND) if you want to automatically extend the size of your datafile when it becomes full. In the "Increment" field, specify the size by which your datafile should be increased each time it becomes full. Use the drop-down list to specify the size in kilobytes (KB), megabytes (MB), or gigabytes (GB). If you want to limit maximum size of the datafile, specify this value in the "Maximum Size" field. Below is the Summary screen if you selected Create on the Create Repository screen. Review the information on this screen, and click Create to begin schema creation. The operations summarized on this page will be performed when you click Create. Click Stop if you want to stop creating the schemas. Below is the Summary screen if you selected Drop on the Create Repository screen. Review the information on this screen, and click Drop to begin the operations summarized on this page. Click Stop if you want to cancel the operation. Below is the Completion Summary screen if you selected Create on the Create Repository screen. This screen contains information about the log files that were created from this RCU operation. You can click on the name of a particular log file to view the contents of that file. If there were any problems encountered during schema creation, you can troubleshoot the issue using the log files. For more information, refer to Section D.2. If errors are encountered during a Create operation, or if a Create operation fails for any component, the Cleanup for failed components checkbox appears on this page and is selected by default. If selected, RCU will perform cleanup operations for the component that failed during the Create operation. If you choose not to select this checkbox, you can cleanup the failed component at a later time by performing a Drop operation for the failed component(s). Review the information on this screen, then click Close to dismiss this screen. Below is the Completion Summary screen if you selected Drop on the Create Repository screen. Note the log file names for each component that are visible in the "Logfile" column. Click rcu.log to view the contents of the main RCU log in a separate window. If there were any problems encountered during schema creation, you can troubleshoot the issue using the log files. For more information, see Appendix D, "Troubleshooting Repository Creation Utility".